NOTE: The instructions to setup a StarlingX Cloud with Controller Storage with containerized openstack services in this guide are under development. For approved instructions, see the StarlingX Cloud with Controller Storage wiki page. A pool of up to seven compute nodes (pool size limit due to the capacity of the storage function). A growth path for storage to the full standard solution with an independent CEPH storage cluster. High availability services runnning across the controller nodes in either active/active or active/standby mode. Storage function running on top of LVM on single second disk, DRBD-sync’d between the controller nodes. On overall controller node failure, all controller high availability services go active on the remaining healthy controller node. 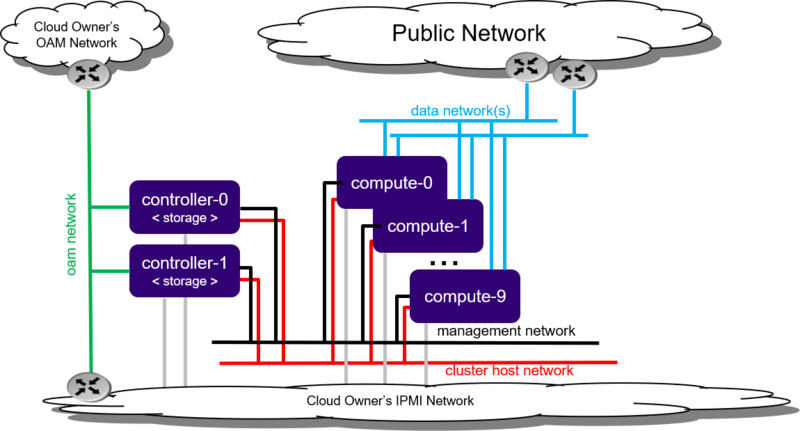 On overall compute node failure, virtual machines on failed compute node are recovered on the remaining healthy compute nodes. Accept all the default values immediately after ‘system date and time’. Unless it is known that the host’s configuration can support the installation of more than one node, it is recommended that the installation and configuration of each node be serialized. For example, if the entire cluster has its virtual disks hosted on the host’s root disk which happens to be a single rotational type hard disk, then the host cannot (reliably) support parallel node installation. REMARK: controller-1 will remain in ‘degraded’ state until data-syncing is complete. The duration is dependant on the virtualization host’s configuration - i.e., the number and configuration of physical disks used to host the nodes’ virtual disks. Also, the management network is expected to have link capacity of 10000 (1000 is not supported due to excessive data-sync time). Use ‘fm alarm-list’ to confirm status. Wait while the compute node is rebooted. Up to 10 minutes may be required for a reboot, depending on hardware. The host is rebooted, and its availability state is reported as in-test, followed by unlocked/enabled. Your StarlingX deployment is now up and running with 2x HA controllers with Cinder storage, 2x computes, and all OpenStack services up and running. You can now proceed with standard OpenStack APIs, CLIs and/or Horizon to load Glance images, configure Nova Flavors, configure Neutron networks and launch Nova virtual machines.